The Compound Effect is about making small but long-term positive life choices. I recently stumbled across the book, The Compound Effect by Darren Hardy which is based on the principle that little decisions and choices made consistently can, in the long run, make a big difference. These small but long-term decisions made each day can have a drastic change on the course of a life. The Compound Effect takes a contrarian approach in today’s culture of hacks, shortcuts and quick fixes. In reality, there is no magic bullet, no magic pill and no secret. Long-term consistency is what matters. The compounding principle is based on the Butterfly Effect. The notion that a butterfly flapping its wings in one corner of the world can cause a tornado in another. The air from the seemingly harmless flapping compounds to create chaos elsewhere. The general premise of the book is that, in life, we can make small decisions each day that can result in a fundamental change over time. The results of which are not immediately noticeable but compound to change the course of someone’s future over the course of a lifetime. It’s a beautiful theory and one that resonates with me in my experience. In the book Hardy provides examples of where compounding takes effect. He references two friends who eat the same each day but one friend decides to cut 125 calories from his daily intake. No big deal in the scheme of things. Cutting 125 calories is not a drastic behaviour change. After 31 months, however, the friend who continued to eat the surplus 125 calories became fat and the one who reduced his intake became thin. The Compound Effect is not immediately noticeable but over time creates an exponential change curve. It can be applied to all areas of life as well as calorie intake and of course compounding can work the opposite way too. Taking the example above if our friend ate 125 calories more instead of less he’d be clinically obese within the 31 months. Choices + Behaviour + Habits + Time = Compound Effect. The accomplishment of any goal is the progressive accumulation, or Compound Effect, of small steps taken consistently over time. Cut your calorie intake by 125 kcals per day. Got to bed 30 mins earlier. Eat an apple instead of a chocolate bar. Aim to lift 2% heavier weights each week at the gym. Walk to work instead of driving or using public transport. See also: The power of walking. Go to that networking event when you don’t feel like it. Offer some advice to a peer, colleague, acquaintance or even someone you don’t know. Aim to go the extra mile by 5% in every piece of work and interaction. Write one blog post every week. Read a little every day. Write a little every day. If you have a hobby like, say, photography try new ways to capture an image. Listen to podcasts and audiobooks as well as music. Watch documentaries as well as TV shows. Save each week in a high-interest account. Buy the store’s own brand instead of the more expensive one. Do intermittent fasting every day and you’ll save the cost of 365 breakfasts each year. If there was ever an example of the power of compounding for finances, it would be Warren Buffett. He amassed the vast majority of his wealth in later years. Yeah, it’s a cheesy one and I write this as a reminder to myself more than anything. Be nice to people even when you don’t feel like it. How we react to other people can compound elsewhere. If someone is nice to you you’re more likely to be nice to someone else and the chain continues. Sometimes we have more of an impact than we think. 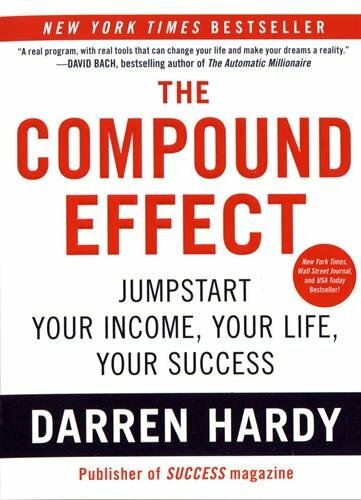 I like the Compound Effect because it doesn’t require any drastic changes or requires you to make a complete life overhaul. All it asks is to put in place little habits and consistently apply them each day. It takes 30 days for a habit to form. No time at all. You’ll fall off the waggon occasionally and no doubt some areas of life will be more out of kilter than others (a balanced life is very hard in the modern world!) but when you’re in it for the long-term consistency is what counts.